FreeWheel has released its Q3 ’15 Video Monetization Report (VMR), which reveals the continuation of a number of important industry trends. Both ad views and video views grew 28% vs. Q3 ’14, consistent with growth rates seen over the past few quarters. Live video was once again the fastest-growing genre, with a 113% year-over-year growth, compared to 30% for long-form and 9% for short-form. Sports was again the biggest driver of live with 63% of sports video viewed live, compared with 17% of news video viewed live (other genres were in low single digits). News had the biggest proportion of short-form (76%), while Entertainment (60%) ad Kids (59%) had the biggest proportion of long-form. Here's some data that contradicts conventional wisdom: in a new survey from Clearleap, 67% of pay-TV subscribers said sports are not the reason they maintain a subscription, citing viewership of programs on other TV networks instead. Even sports fans didn't express a lot of enthusiasm for sports as justifying the multichannel bundle, with almost half citing other programs they watch as requiring a subscription. There has always been a strong industry consensus that live sports were the firewall for pay-TV's multichannel bundle. Even as entertainment programming has proliferated in OTT services and elsewhere, the only place to get marquee sports programming was on pay-TV. Therefore, the reasoning went, sports were the "glue" keeping subscribers on board. TV Everywhere proponents will find a lot to like in FreeWheel's newly released Q2 2014 Video Monetization Report. Ad views on authenticated on demand long-form plus live-streaming content grew 619% vs. Q2 '13. Fully 38% of these content formats' ad views now come via authentication, up from just 8% a year ago. Live content was up 201% year-over-year, with 81% of live ad views attributable to sports. Q2 included marquee events like World Cup, NBA and NHL playoffs. The share of live content's ad views vs. total ad views increased from 8.1% in Q2 '13 to 18.3% in Q2 '14. The Internet has been a boon to sports fans, with the new "Know the Fan" report from Sporting News Media, Kantar Media Sports and SportBusiness Group revealing that approximately 2/3 of U.S. sports fans follow sports online. In particular, 38% of fans who watch sports video online cited live-streaming of games/events as their top activity (up from 33% in 2013), followed by short highlight clips (31%) and videos of sports news (27%). FreeWheel has released its Q4 '13 video monetization report, revealing among things, that ads viewed in live streaming jumped 148% vs. Q4 '12, and now account for nearly 10% of ads viewed in online video streams served by pay-TV operators and TV networks. Related, ad views in authenticated, TV Everywhere content rose 268% vs. Q4 '12. Overall, ad views were up 30% year-over-year. Brian Dutt, who manages Advisory Services at FreeWheel and oversaw the report, shared more detail behind these and other data being released. Adobe has published its Q4 '13 U.S. Digital Video Benchmark report, finding that authenticated TV Everywhere streams more than doubled in 2013 to 574.2 million, up from 222.5 million in 2012. As the graph below shows, 73% of authenticated views occurred on mobile devices, 22% on desktop and less than 5% each on gaming consoles and connected TVs. For the mobile viewing, tablet share more than doubled vs. 2012 to 42%, with smartphone declining to 31%. It turns out that football not only drives audience spikes on TV, but also online video advertising and engagement across devices. That's according to Adap.tv which this morning released select data from its video ad marketplace. Adap.tv has found that football has driven an overall 81% increase in video ad opportunities, with a 127% bump in smartphone video ads, 120% on desktops and 22% on tablets. Another great example of how video syndication is continuing to deliver results: in November's comScore rankings of U.S. sports properties, Perform Sports edged out perennial leader ESPN in number of total monthly unique viewers. As the chart below shows, Perform had 24.532 million viewers and ESPN had 24.092 million. Yahoo Sports is a distant third with 9.988 million, followed by another syndicator, CineSport, with 8.367 million and NFL with 5.936 million. NBC was justifiably crowing late yesterday that the London Olympics was the most-watched TV event in U.S. history with 219.4 million viewers, but a more profound long-term takeaway from this year's games is that digital distribution of most of the competitions did not seem to hurt tape-delayed on-air viewing at all. That was not a foregone conclusion, and given the billions in broadcast rights fees it paid, NBC made a sizable bet that with most competitions live-streamed and available on-demand, audiences would still tune in during ad-rich, prime-time hours, despite already knowing (or having seen) the results. The impact of digital distribution could have gone wrong, driving lower prime-time ratings, creating disgruntled advertisers and embarrassing NBC Sports executives. The fact that it didn't buttresses the argument that for sports in particular, digital delivery is a compliment, not a substitute, for on-air. The Olympics is currently dominating the sports world's attention, but have a look at comScore's first half 2012 data (chart below), and what jumps out is that 2 of the top 4 properties aren't well-known branded destinations, but rather little-known video syndicators, Perform Sports and CineSport. Perform is #2, with 14.6 million average monthly unique viewers, trailing predictable leader ESPN, which has 20.5 million. 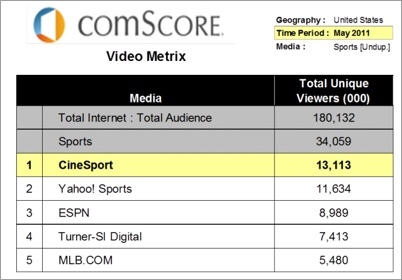 And CineSport is #4 with 11.4 million average monthly unique viewers, behind #3 Yahoo Sports, which has 12.4 million. Following them are properties you'd expect to see on any top 10 list: Turner Sports, MLB, Fox Sports, NBC Sports, NFL and CBS Sports. The first-ever streaming Super Bowl attracted over 2.1 million unique viewers, who consumed 78.6 million minutes. That surpassed NBC's expectations, according to Kevin Monaghan, SVP, Business Development and Managing Director of Digital Media at NBC Sports Group, who said that usage increased throughout the game and peaked in Q4 during the Giants' final touchdown drive. According to Omniture and mDialog data, it was the most-viewed live-streamed single game ever. Here's a interesting tidbit from comScore's Video Metrix - the top sports property in May, as ranked by unique viewers, wasn't any of the names you'd expect (e.g. Yahoo Sports, ESPN, MLB, SI, etc. ), but rather a little-known, four year-old start-up named CineSport. As the chart below shows, CineSport generated 13.1 million unique viewers in May to top the list (CineSport was actually number one in April too, and has been so periodically before as well). How CineSport is generating so much viewership says a lot about how online video is creating unexpected new opportunities for those with clever approaches. Last week I caught up with CineSport's CEO and founder Gregg Winik to learn more. ESPN released the its latest round of research on cord-cutting this week, finding that a tiny .18% of American homes with both pay-TV service and a broadband connection dropped their video service between the fourth quarter of 2010 and the first quarter of 2011. ESPN said the .18% is actually lower than the .28% it found in its prior period research and is fully offset by a comparable number of people who upgraded from a "broadcast-only" service level to a full pay-TV package. Not surprisingly, ESPN said that among medium-to-heavy sports viewers there was zero cord-cutting. Not content to sit by and watch the headlines claiming significant cord-cutting is underway, ESPN is wading into the cord-cutting research fray, releasing a new analysis of its own, which it asserts that the activity has been totally overblown. By analyzing Nielsen data, ESPN says that in the past 3 months, .28 percent of U.S. households have cut the cord, though mitigating this decrease is that .17 percent of households that had been subscribing to the lowest tier of pay-TV service (dubbed "broadcast-only") upgraded to pay-TV and broadband Internet services. With approximately 110 million households in the U.S., ESPN is saying around 308,000 homes cut the cord, with 187,000 upgrading from broadcast-only, for a net loss due to cord-cutting of 121,000 households. Interestingly, that 121,000 households is quite close to the 119,000 subscribers that SNL Kagan said that U.S. pay-TV operators lost in Q3 '10. FreeWheel is on a roll, now serving almost 2 billion video ads/month, doubling its volume just since November, 2009. In addition, the company has added Major League Baseball Advanced Media to its customer roster and began implementing ads during the fall playoff season. The MLB win comes on top of recently announced customers Turner Broadcasting System and VEVO. FreeWheel's co-CEO/co-founder Doug Knopper brought me up to speed on all the news late last week. Doug said that part of the increase in FreeWheel's volume is attributable to the additional customers that have come on board, but he's also very excited about the year-over-year growth in ad volume FreeWheel is seeing for longer-term customers ("same store sales" if you will). FreeWheel is seeing big increases due to 3 factors: customers posting greater quantities of video, plus deepening viewership of that video (all of this borne out by comScore's '09 video consumption data); customers' improving ability to actually sell ads against these videos (reflecting the shift of budgets to the online video medium); and reduced friction through the emergence of "accepted practices" in ad operations. FreeWheel is also benefiting from its specialization in helping content providers monetize their video on third-party sites (e.g. YouTube, AOL, MSN, Fancast, etc.). More and more content executives are realizing that sizable viewership opportunities exist by syndicating their video outside of their own properties. Doug said that every content company FreeWheel is now talking to is interested in some kind of syndication. Doug described 3 types of syndication he's seeing: (1) across a family of sister corporate sites, such as PGA.com providing CNN.com video, which are both owned by Turner; (2) between affiliated entities like local MLB teams providing video to the main MLB.com hub and (3) externally, to unaffiliated 3rd parties, such as WMG music providing videos to YouTube. Given all this syndication activity, I was interested to learn from Doug what percentage of the ads FreeWheel serves fall into each of these 3 buckets vs. what percentage are served on the customer's sites themselves. Doug said that FreeWheel is pulling those numbers together in a way that ensures its customers privacy and will get back to me when he has them. In addition to the above syndication activity, FreeWheel is seeing experimentation with delivering ads to mobile devices, convergence/CE players and Internet-enabled TVs. In all these cases, customized ad policies determine who sells what ad inventory and how revenue is shared and reported. Powering all of this has been part of FreeWheel's core mission from inception, making it a key player in what I've called the 'syndicated video economy." FreeWheel's growth echoes what I've been hearing lately from both video ad network executives and video content providers. They too are talking about rapidly rising volumes and improving monetization. As I wrote recently, I've been impressed lately by efforts to make video ads more engaging and provide a better ROI, a trend I see continuing. Taken together, while it's still relatively early days, online video advertising seems to be making great strides. I saw '08 as a year in which the broadband ad model continued growing in importance as the paid model remained in the back seat, at least for now. I think that's pretty much been borne out. We've seen countless new video-oriented sites launch in '08. To be sure many of them are now scrambling to stay afloat in the current ad-crunched environment, and there will no doubt be a shakeout among these sites in '09. However, the basic premise, that users mainly expect free video, and that this is the way to grow adoption, is mostly conventional wisdom now. The exception on the paid front continues to be iTunes, which announced in October that it has sold 200 million TV episode downloads to date. At $1.99 apiece, that would imply iTunes TV program downloads exceed all ad-supported video sites to date. The problem of course is once you get past iTunes things fall off quickly. Other entrants like Xbox Live, Amazon and Netflix are all making progress with paid approaches, but still the market is held back by at least 3 challenges: lack of mass broadband-to-the-TV connectivity, a robust incumbent DVD model, and limited online delivery rights. That means advertising is likely to dominate again in '09. I expected that '08 would see more brands pursue direct-to-consumer broadband-centric campaigns. Sure enough, the year brought a variety of initiatives from a diverse range of companies like Shell, Nike, Ritz-Carlton, Lifestyles Condoms, Hellman's and many others. What I didn't foresee was the more important emphasis that many brands would place on user-generated video contests. In '08 there were such contests from Baby Ruth, Dove, McDonald's, Klondike and many others. Coming up in early '09 is Doritos' splashy $1 million UGV Super Bowl contest, certain to put even more emphasis on these contests. I see no letup in '09. I was very bullish on the opportunity for the '08 Summer Games to redefine how broadband coverage can add value to live sporting events. Anyone who experienced any of the Olympics online can certainly attest to the convenience broadband enabled (especially given the huge time zone difference to the U.S.), but without sacrificing any video quality. The staggering numbers certainly attested to their popularity. Still, some analysts were chagrined by how little revenue the Olympics likely brought in for NBC. While I'm always in favor of optimizing revenues, I tried to take the longer view as I wrote here and here. The Olympics were a breakthrough technical and operational accomplishment which exposed millions of users to broadband's benefits. For now, that's sufficient reward. 4. 2008 is the "Year of the broadband presidential election"
With the '08 election already in full swing last December (remember the heated primaries? ), broadband was already making its presence known. It only continued as the year and the election drama wore on. As I recently summarized, broadband was felt in many ways in this election cycle. President-elect Obama seems committed to continuing broadband's role with his weekly YouTube updates and behind-the-scenes clips. Still, as important as video was in the election, more important was the Internet's social media capabilities being harnessed for organizing and fundraising. Obama has set a high bar for future candidates to meet. Here's one I overstated. Last December, I thought the WGA strike would accelerate interest in broadband as an alternative to traditional outlets. While it's fair to include initiatives like Joss Wheedon's Dr. Horrible and Strike.TV as directly resulting from the strike, the reality is that I believe there was very little embrace of broadband that can be traced directly to the strike (if I'm missing something here, please correct me). To be sure, lots of talent is dipping its toes into the broadband waters, but I think that's more attributable to the larger climate of interest, not the WGA strike specifically. I suggested that "99.9% of users who start the year watching broadband video on their computers will end the year no closer to watching broadband video on their TVs." My guess is that's turned out to be right. If you totaled up all the Rokus, AppleTVs, Vudus, Xbox's accessing video and other broadband-to-the-TV devices, that would equal less than .1% of the 147 million U.S. Internet users who comScore says watched video online in October. However, there are some positive signs of progress for '09. I've been particularly bullish on Netflix's recent moves (particularly with Xbox) and expect some other good efforts coming as well. It's unlikely that '09 will end with even 5% of the addressable broadband universe watching on their TVs, but even that would be a good start. Meanwhile, HD had a banner year. Everyone from iTunes to Hulu to Xbox to many others embraced online HD delivery. As I mentioned here, there are times when I really do catch myself saying, "it's hard to believe this level of video quality is now available online." For sure HD will be more widely embraced in '09 and quality will get even better. OK, that's it for '08. On Monday the focus turns to what to expect in '09.